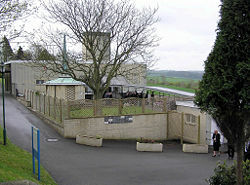 The crematorium at Haycombe Cemetery, Bath, England. Cremation, or the practice of burning the dead, refers to the disposal of a human corpse by burning in a crematorium furnace or crematory fire. Bodies of the deceased can also be burned in a crematorium pit or trench, or, on occasion, in the house in which they lived. Cremation practices are historically very ancient and widespread, and are the second most common way to dispose of the dead, after burial. Disposal of the cremated remains often shows the most variation; the most common practice both historically and contemporaneously is to house the ashes in a pottery vessel or decorative urn. The container can then be buried or put on display in the home of a loved one. Other practices may include the scattering of ashes over a body of water, or a plot of land. The disposal of cremated ashes often varies throughout different parts of the world. Cremation practices may be used for a variety of reasons. Some cultures may view fire as a purifying agent and see the practice of cremation as the most respectful way to dispose of the dead. Other societies may believe cremation to light the way into the afterlife, or to prevent the spirit of the deceased from returning to the world of the living. More modern reasoning may include the shortage of land in urban areas. Historically, cremation was widely practiced throughout the ancient world as the most proper way to dispose of the dead. Early cremation practices placed the body in a log pyre over an open flame and waited until the corpse was consumed by fire, eventually leaving only ashes. Archaeologists have found the practice of cremation to be used by the indigenous peoples of the Pacific Northwest, the Northern Athapascan people of Alaska, and various cultural groups throughout Canada. The practice can be traced back to the early Greeks as early as 1000 B.C.E. who used it as a predominate means to dispose of the bodies of heroes and war dead. Among the Romans, cremation marked the disposal of the rich and largely became a status symbol throughout the civilization. Pagan Scandinavians were also found to cremate their dead, as did ancient Indian societies. Cremation in Hinduism, notable for not only allowing but prescribing the practice, can be first attested in the Cemetery H culture, from about 1900 B.C.E. In some areas of Asia, only the most praised members of a society were cremated, such as the Tibetan high lamas. Early Christianity vehemently opposed cremation in an attempt to abolish early pagan rituals; following 1000 C.E., the practice was widely abandoned throughout much of Europe except in extreme circumstances such as disposal of the victims of the Black Death plague. The practice reemerged in the late nineteenth century due to the rise of large cities and the reform of public health practices. In Britain, the cremation movement also found the support of Queen Victoria's surgeon, Sir Henry Thompson, who together with colleagues founded the Cremation Society of England in 1874. The first crematoria in Europe were built in 1878, in Woking, England, and Gotha, Germany; the first in North America was founded in 1876, by Francis Julius LeMoyne in Washington, Pennsylvania. Some of the various Protestant churches came to accept cremation, with the rationale being, "God can resurrect a bowl of ashes just as conveniently as he can resurrect a bowl of dust." In 1963, Pope Paul VI lifted the ban on cremation, and in 1966, allowed Catholic priests to officiate at cremation ceremonies. Today, modern cremation practices do not burn the corpse by flame but, instead, by intense heat that steadily diminishes the body to fine ash. Cremation occurs in a "crematorium" consisting of one or more cremator furnaces or cremation "retorts" for the ashes. A cremator is an industrial furnace capable of generating 870-980 °C (1600-1800 °F) to ensure disintegration of the corpse. A crematorium may be part of chapel or a funeral home, or part of an independent facility or a service offered by a cemetery. A cremation furnace is not designed to cremate more than one body at a time, which is illegal in many countries, including the United States. The chamber where the body is placed is called the retort and is lined with refractory brick that retains heat. Modern cremators are computer controlled to ensure legal and safe use; the door cannot be opened until the cremator has reached operating temperature. The coffin is inserted, or charged, into the retort as quickly as possible to avoid heat loss through the top-opening door. Some crematoria allow relatives to view the charging. This is sometimes done for religious reasons, such as in traditional Hindu funerals. A body to be cremated is first placed in a container for cremation, which can be a simple corrugated cardboard box or a wooden casket. Most casket manufacturers provide a line of caskets specially built for cremation. Another option is a cardboard box that fits inside a wooden shell designed to look like a traditional casket. After the funeral service the interior box is removed from the shell before cremation, permitting the shell to be reused. Funeral homes may also offer rental caskets, which are traditional caskets used only for the duration of the services, after which the body is transferred to another container for cremation. Rental caskets are sometimes designed with removable beds and liners, replaced after each use. In the United Kingdom, the body is not removed from the coffin, and is not placed into a container as described above. The body is cremated with the coffin, which is why all UK coffins that are to be used for cremation must be made of combustible material. The Code of Cremation Practice forbids the opening of the coffin once it has arrived at the crematorium, and rules stipulate that it must be cremated on the same day as the funeral service. Jewelry is strongly advised to be removed before the coffin is sealed, as the coffin cannot be opened once it has been received at the crematorium. After the cremation process has been completed, the remains are passed through a magnetic field to remove any metal, which will be interred elsewhere in the crematorium grounds. In Australia, the deceased are cremated in a coffin supplied by the undertaker and any reusable or cardboard coffins cannot be used. If cost is an issue, a plain, particle-board coffin, known as a "chippie," will be offered. Handles, if fitted, are plastic and approved for use in a cremator. Coffins vary from unfinished particle board to solid timber, though most are veneered particle board. Cremations can be "delivery only," with no preceding chapel service at the crematorium, or preceded by a service in one of the crematorium chapels. Delivery-only allows crematoriums to schedule cremations to make best use of the cremators. The box containing the body is placed in the retort and incinerated at a temperature of 760 to 1150 °C (1400 to 2100 °F). During the cremation process, a large part of the body, including the organs and other soft tissue, are vaporized and oxidized due to the heat, and the gases are discharged through the exhaust system. The entire process usually takes about two hours. Jewelry, such as wristwatches and rings, is ordinarily removed and returned to the family. The only non-natural item required to be removed from the body is a pacemaker, as a pacemaker could explode and damage the cremator. In the United Kingdom, the undertaker is required to remove pacemakers prior to delivering the body to the crematorium, and sign a declaration stating that any pacemaker has been removed. After the incineration is completed, the bone fragments are swept out of the retort, and the operator uses a pulverizer, known as a cremulator to process the fragments into what are known as cremains which exhibit the appearance of grains of sand. Cremulators usually use some kind of rotating or grinding mechanism to powder the bones, such as the heavy metal bearings. In Japan and Taiwan, the bones are not pulverized unless requested beforehand, and are collected by the family. An alternative method used in some cultures, such as Hinduism, is burning the corpse on a pyre. A pyre is a pile of wood upon, or within, which the deceased body is placed. The mound is lit on fire; the fire consumes the wood and the deceased. This method is not commonly found in the western world, where crematorium furnaces are used, and is often forbidden by law. The remaining ashes are placed in a container, which can be anything from a simple cardboard box to a fancy urn. An unavoidable consequence of cremation is that a tiny residue of bodily remains is left in the chamber after cremation and mixes with subsequent cremations. Cremated remains can be kept in an urn, sprinkled on a special field, mountain, in the sea, or buried in the ground. In addition, there are several services which will scatter the cremated remains in a variety of ways and locations. Some examples are via a helium balloon, through fireworks, shot from shotgun shells, or scattered from a plane. One service will send the remains into space and another will have them turned into a diamond in an artificial diamond manufacturing machine, as the ashes are mainly carbon based. They can also be incorporated, with urn and cement, into part of an artificial reef, or they can also be mixed into paint and made into a portrait of the deceased. Cremated remains can be scattered in national parks within the United States, with a special permit. They can also be scattered on private property, with the owner's permission. A portion of the cremated remains may be retained in a specially designed locket known as a keepsake pendant. The final disposition depends on the personal wishes of the deceased as well as their religious beliefs. Some religions will permit the cremated remains to be sprinkled or kept at home. Others, such as Roman Catholicism, insist on either burying or entombing the remains. Hinduism obliges the closest male relative of the deceased to immerse the cremated remains in the holy river Ganges, preferably at the holy city of Haridwar, India. The cremated remains may also be entombed, in case the deceased was a well-known person. In Japan and Taiwan, the remaining bone fragments are given to the family and are used in a burial ritual before final interment. Some individuals may prefer cremation for personal reasons. For others it is because they are not attracted to traditional burial; the thought of a long, slow decomposition process may be personally unappealing. Others may view cremation as a way of simplifying their funeral process. These people view a traditional burial as an unneeded complication of their funeral process, and thus choose cremation to make their services as simple as possible. 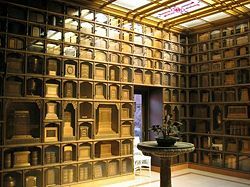 Interior of a columbarium in Oakland, California. Some of the cinerary urns are book-shaped. Cost factors may also tend to make cremation more attractive. Generally speaking, cremation costs less than traditional burial services, especially if direct cremation is chosen, in which the body is cremated as soon as legally possible without any sort of service. However, there is wide variation in the cost of cremation services, having mainly to do with the amount of service desired by the deceased or the family. A cremation can take place after a full traditional funeral service, which may add cost. The type of container used may also influence cost. Cremated remains can be scattered or buried. Cremation plots or columbarium niches usually cost less than a burial plot or mausoleum crypt, and require less space. However, some religions, such as Roman Catholicism, require the burial or entombment of cremated remains. To some, cremation might be preferable for environmental reasons. Burial is a known source of certain environmental contaminants. Embalming fluids, for example, are known to contaminate groundwater with mercury, arsenic, and formaldehyde. The coffins themselves are another known source of contamination. Yet another environmental concern, of sorts, is that traditional burial takes up a great deal of space. In a traditional burial, the body is buried in a casket made from a variety of materials. In America, the casket is often placed inside a concrete vault or liner before burial in the ground. While individually this may not take much room, combined with other burials it can, over time, cause space concerns. Many cemeteries, particularly in Japan and Europe as well as those in larger cities, are beginning to run out of burial plots and space. In Tokyo, for example, traditional burial plots are extremely scarce and expensive. However, there exists a body of research that indicates cremation has a significant impact on the environment. Major emissions from crematories include nitrogen oxide, carbon monoxide, sulfur dioxide, particulate matter, mercury, hydrogen fluoride, hydrogen chloride, and other heavy metals. 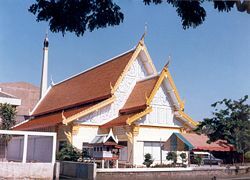 A crematorium in Bangkok, Thailand. While the Abrahamic religions prohibit cremation or prefer burial over cremation, the Eastern religions, known as the Dharmic faiths such as Hinduism and Buddhism mandate the use of cremation. In these religions the body is seen as an instrument to carry the soul in that birth. As an example the Bhagavad Gita quotes "Just as old clothes are cast off and new ones taken, the soul leaves the body after the death to take a new one." Hence, the dead body is not considered sacred since the soul has left the body. Hence, cremation is regarded as ethical by Eastern religions. In Sikhism, burial is not prohibited, although cremation is the preferred option for cultural reasons rather than religious. According to Hindu traditions, the reasons for preference of destroying the corpse by fire over burying it into ground, is to induce a feeling of detachment into the freshly-disembodied spirit, which will be helpful to encourage it into passing to "the other world." Cremation is referred to as antim-samskara, literally meaning "the last rites." At the time of the cremation or "last rites" a Puja, or Hindu prayer to assist the spirit to transcend into the afterlife, is performed. The Catholic Church's early discouragement of cremation stemmed from several ideas. Firstly, the Church believes that the body, as the instrument through which the sacraments are received, is itself a sacramental holy object. Secondly, a body acts as an integral part of the human person, and a soul, all by itself, does not constitute a human being. Thirdly, in imitation of Jesus Christ's burial, the Church believes a body of a Christian should be buried, and finally, that cremation practices constituted a denial of the resurrection of the body. Though the Catholic Church still officially prefers the traditional burial or entombment of the deceased, cremation is now freely permitted as long as it is not done to express a refusal to believe in the resurrection of the body. Until 1997, Catholic liturgical regulations required that cremation take place after the funeral Mass, so that, if possible, the body might be present for the Mass to receive the blessings and be the subject of prayers in which it is mentioned. Once the Mass itself was concluded, the body could be cremated and a second service could be held at the crematorium or cemetery where the ashes were to be interred just as for a body burial. Protestant churches were more welcoming of the use of cremation at an earlier date than the Catholic Church, though pro-cremation sentiment was not always unanimous among Protestants. The first crematoria in predominately Protestant countries were built in 1870s, and in 1908, the Dean and Chapter of Westminster Abbey, one of the most famous Anglican churches, required that remains be cremated for burial in the abbey's precincts. Scattering, or "strewing," is an acceptable practice in many Protestant denominations, and some churches have their own "garden of remembrance" on their grounds in which remains can be scattered. Other Christian groups also support cremation, including the Jehovah's Witnesses. Some branches of Christianity continue to oppose cremation, most notably the Eastern Orthodox Church. Exceptions are made for circumstances where it may not be avoided, or if it may be sought for good cause, but when a cremation is willfully chosen without good cause by the one who is deceased, he or she is not permitted a funeral in the church and may also be permanently excluded from liturgical prayers for the departed. In Orthodoxy, cremation is a rejection of the dogma of the general resurrection, and as such is viewed harshly. Judaism has traditionally disapproved of cremation. However, during the nineteenth and early twentieth centuries, as the Jewish cemeteries in many European towns had become crowded and were running out of space, cremation became an approved means of corpse disposal amongst the Liberal Jews. Reform Judaism still supports cremation, although burial remains the preferred option. Orthodox Jews have maintained a stricter line on cremation, and disapprove of it as Halakha, or Jewish law, forbids it. This halakhic concern is grounded in the upholding of bodily resurrection as a core belief of "mainstream" Judaism, as opposed to other ancient trends such as the Sadduccees, who have denied it. Also, the memory of the Holocaust, where millions of Jews were murdered and their bodies disposed of by burning them either in crematoria or burning pits, has given cremation extremely negative connotations for Orthodox Jews. Since the organization of the Church in 1830, the Church of Latter-day Saints have been encouraged by their leaders to avoid cremation, unless it is required by law, and, wherever possible, to consign the body to burial in the earth and leave the dissolution of the body to nature. President Spencer W. Kimball wrote, "The meaning of death has not changed. It releases a spirit for growth and development and places a body in…Mother Earth" (p. 45). In due time the mortal body returns to native element, and whether it is laid away in a family-selected site or buried in the depths of the sea, every essential part will be restored in the Resurrection: "Every limb and joint shall be restored to its body; yea, even a hair of the head shall not be lost; but all things shall be restored to their proper and perfect frame" (Alma 40:23). As a rule, the Parsis strongly forbid cremation, as it defiles the fire, symbol of all that is sacred. Burial is also disavowed, for similar reasons, and the traditional method of corpse disposal is the exposing of the bodies to vultures in "Towers of silence." However, some contemporary figures of the faith have opted for cremation. The former Queen lead singer, Freddie Mercury, who was a Parsi-Zoroastrian, was cremated after his death. In addition, Rajiv Gandhi received a well-publicized cremation with full Hindu Vedic rites, on a sandalwood pyre, though he had a Parsi father. 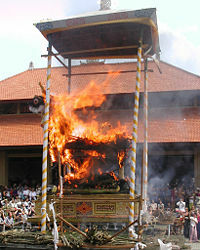 According to Feminist interpretations of the archaeological record, cremation is the usual means of corpse disposal in Patriarchal religions, the rising smoke symbolizing the deceased's spirit ascending to the domain of the Father deities in the heavens, while Matriarchal religions are speculated to have favored interment of the corpse, often in a fetal position, representing the return of the body to Mother Earth in the tomb which represents the uterus. Of modern Neo-Pagan religions, Ásatrú favors cremation, as do forms of Celtic paganism. ↑ Matthew F. Kohmescher, Catholicism Today: A Survey of Catholic Belief and Practice (Paulist Press, 1999), p. 178-179. ↑ Cremation Waste and Toxins Retrieved May 5, 2015. ↑ Satguru Sivaya Subramuniyaswami, Living With Siva: Hinduism's Contemporary Culture (Himalayan Academy, 2001, ISBN 0945497989), p. 750. ↑ 4.0 4.1 4.2 Douglas J. Davies and Lewis H. Mates (eds. ), "Cremation, Death and Roman Catholicism," Encyclopedia of Cremation (Ashgate Publishing, 2005, ISBN 0754637735). ↑ The Vatican, Article 2301 of the Catechism of the Catholic Church. Retrieved June 20, 2008. ↑ Douglas J. Davies and Lewis H. Mates (eds. ), "Westminster Abbey," Encyclopedia of Cremation (Ashgate Publishing, 2005, ISBN 0754637735). ↑ www.3saints.com, On Cremation. Retrieved February 3, 2007. ↑ Rabbi Walter Rothchild, Cremation. Retrieved May 5, 2015. ↑ Tzvi Freeman, What is the Jewish view of cremation? Retrieved June 20, 2008. Aiken, Lewis R. Dying, Death and Bereavement. Lawrence Erlbaum Associates. 2000. ISBN 0805835040. Carlson, Lisa. Caring for the Dead. Upper Access Inc. 1997. ISBN 0942679210. Davies, Douglas J., and Lewis H. Mates (eds.). Encyclopedia of Cremation. Ashgate Publishing. 2005. ISBN 0754637735. Green, Jennifer. Dealing With Death: Practices and Procedures. Jessica Kingsley Publishers. 2006. ISBN 1843103818. Spongberg, Alison L. "Inorganic Soil Contamination from Cemetery Leachate." Water, Air & Soil Polution Journal. Volume 117. 2000. Sublette, Kathleen. Final Celebrations: A Guide for Personal and Family Funeral Planning. Pathfinder Publishing. 1992. ISBN 0934793433. Warren, M. "The Anthropometry of Contemporary Commercial Cremation." Journal of Forensic Science. Volume 42. 1997. This page was last modified on 5 May 2015, at 22:43.